New research by Searchfield Homes reveals the most profitable commuter towns in London’s commuter belt to build your own home. Harpenden in Hertfordshire tops the list (see Table 1) as the best commuter town for self-build, followed by Esher and Weybridge, both in Surrey. In all three areas, self-builders looking to knock down an existing property to make way for a new one can achieve a return on investment (ROI) of more than 35% if they are able to obtain planning consent for a new house twice the size. Most self builds around the capital are built on plots with an existing house that is demolished to make way for the new one. As a rule of thumb, for the build to be profitable the self-builder will require planning consent for a house that is larger than the original, so it is worth more than the cost of the plot and building it. 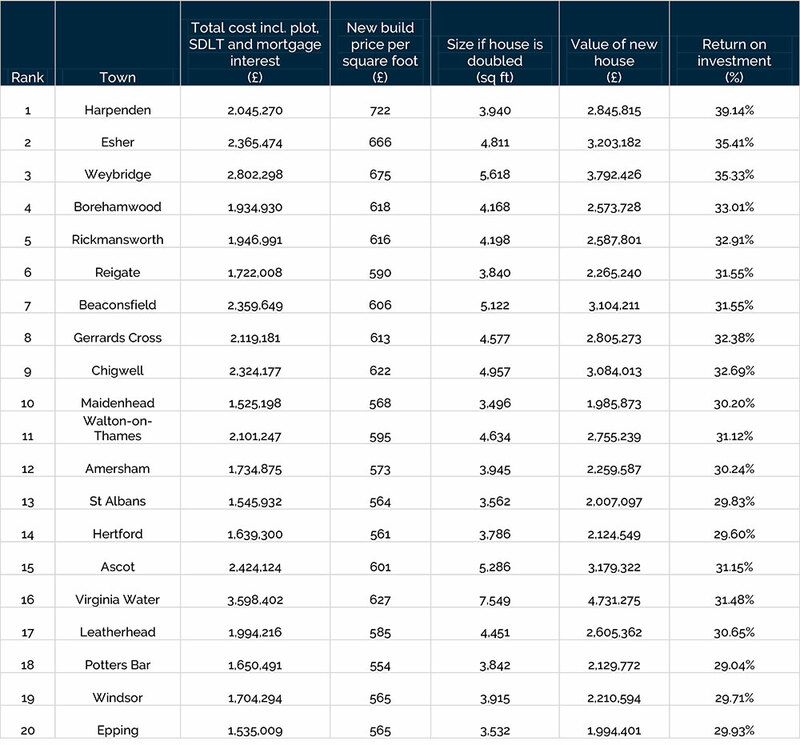 Assuming the self builder has been able to obtain planning consent for a house twice as large as the one it is replacing, Searchfield has ranked the top 20 towns within an hour commute of London by their return on investment. In first place Harpenden, self-builders purchasing the average detached plot will spend £2m (including the plot, SDLT and mortgage interest) building a new £2.8m house that’s twice the size of the exiting property, delivering a return on investment of 39%. The most affordable town in the top 20 is Epping in Essex where you can build a home that’s double the size of the existing property for circa £1.5m. Surrey and Hertfordshire offer the greatest choice for self-builders, with 12 of the top 20 commuter towns falling within the borders of these two counties. As well as ensuring self-builders don’t lose money when they come to sell, locations that produce the highest return on investment are key for financing the build. Most lenders restrict the loan amount to 60% of the final valuation and stipulate that it does not exceed 90% of the total cost of the build and land. If the project is loss making, it will be impossible to secure finance without a substantial injection of equity. “Now is the ideal time to build your own home. The Government is keen to double the number of self-build homes to 20,000 by 2020 and is incentivising local councils to include self and custom build developments in their plans for future housing. When it comes to high value homes, the stamp duty saving also makes self-build compelling, with SDLT charged on the purchase of the plot as opposed to the value of the completed property. Find a plot with an older house that isn’t restricted by listed buildings and conversation areas. 1930s houses are ideal because of their large gardens and comparatively lower prices per square foot. Hire a RICS surveyor to value the price per square foot of your proposed house. Calculate the minimum size required for the house to be worth more than the build cost. Discuss your proposals with the local planning authority and a planning consultant before purchasing a plot. Put in a planning application for the biggest house that you can a) afford and b) the local authority will permit.